Secular Professor Sees Dangers Of Ever-Changing Bible Versions!Secular Professor Sees Dangers Of Ever-Changing Bible Versions! Secular Professor Sees Dangers Of Ever-Changing Bible Versions! I was doing some research today and ran across an interesting article at PsychologyToday.com. We hear so much downplaying from religious leaders these days concerning all the different versions of the Bible. The only crowd which genuinely seems to care and love the Bible enough to make a big fuss over it is the beloved King James Bible bunch. "Faith is the substance of things hoped for, the evidence of things not seen." So runs the celebrated line in Hebrews 11:1, the rationale that underpins so much of the Judeo-Christian tradition. According to that rationale, as the writer of the Epistle puts it, faith is a summation of hope and evidence apparently lies in "things not seen"—in the invisible and ineffable. Considering the importance of the line in Hebrews as an anchor to Judeo-Christian belief and faith, it's worth noting—as websites detailing various editions of the Bible underscore—that even minor changes in translation have dramatic implications for the way people view and understand their faith." "The line I quoted was from the King James version of the Bible, dating from the 17th century and treated as current at least until the end of the 19th. But when the English Revised Version appeared between 1881 and 1885 (with the New Testament appearing before the Old), after an army of scholars labored to render the Hebrew, Greek and Latin Vulgate more reliable than before, the celebrated line in Hebrews appeared quite differently." Professor Lane brings attention to a critically important and epidemic problem in churches today, that is, we have so many Bible versions that for anyone to claim that their Bible is perfect and inspired holds no credibility anymore. People are confused. Every time that someone publishes a “new” Bible version and professes it to be God's Word—it is like the boy who cried “wolf” so much that no one in the village believed him anymore. There have been over 400 different versions of the English Bible published since the Authorized Version of 1611 (later called the King James Version) was published. "Faith is the substance of things hoped for" became a psychological proposition, as William James made clear in The Will to Believe (1896), even as he defended that stance and worried about faith trying to express itself "in the language of the gaming-table." As James well-knew, the devout understandably want to view their faith as inevitable—as existing beyond chance, contingency and debate. Close examination of key passages in the Bible underscores, by contrast, that the book they worship is far from reliable, its meaning altered by successive generations of translators, each hoping to put their indelible stamp on it, to cast its ever-changing message as fixed and eternal." It is a sign of the apostate times in which we live that America's churches have embraced the Bible-a-month-club, eagerly swapping out their beloved King James Bible for another translation every few years. The consequence is a world filled with hundreds of Bible versions—all of which say different things and confuse most people, especially those seeking the truth. One of the most detrimental consequences of continually changing Bibles is that the motivation to memorize the Words of God is all but completely lost. Who wants to memorize a Bible that's not going to be popular anymore in 5-10 years? I grew up with the King James Bible, it's the ONLY Bible that I use now, and I will die using the King James Bible. I have memorized hundreds of Scriptures which are helpful and precious to me. You couldn't offer me all the wealth, pleasures nor fame in this world to part with my beloved King James Bible. Besides, the English literary beauty is unsurpassed in which the King James Bible is written. God knew what He was doing, giving us an English Bible for these Last Days. It's not a coincidence that English is fast-becoming the international language. There will NEVER be another Bible translation for this world until the Lord Jesus Christ returns, other than the preserved and inspired King James Bible. Please read, The Importance Of Thee And Thou. It is tragic that most people don't view the Bible as being special, from God. Most people think of the Bible as a Jewish history book, but it's oh so much more. The Bible came forth from God, every Word. It is “by faith” that faithful Christians today continue to use the reliable and Christ-honoring King James Bible. Beware of the Bible-correcting crowd who think they know more than the 53 scholars who translated the King James Bible. "We never thought from the beginning, that we should need to make a new Translation, nor yet to make of a bad one a good one ... but to make a good one better." Don't trade in your double-edge Sword for a plastic knife! NIV Perverts Philippians 2:6 to Teach That Jesus Isn't God! Which Bible version is correct? Is Jesus God or not? Christians who have studied the Scriptures know that Jesus is almighty God (John 1:1-3,14; John 10:33; Isaiah 9:6; Revelation 1:8). Thus, the NIV teaches a lie. Isaiah 42:8, “I am the LORD: that is my name: and my glory will I not give to another, neither my praise to graven images.” Jesus would not have accepted worship unless He were the Godhead incarnate, that is, God in the flesh (Colossians 2:9 - King James Bible). There is no confusion to those who truly love the Lord. Only the King James Bible truly glorifies and honors the Son of God, Who is called the Word of God (John 1:1-3,14; Revelation 19:13). I had a man write to me once and try to convince me that Jesus wasn't God and he quoted Philippians 2:6 from the NIV. He said that Jesus wasn't the manifestation of God in the flesh. Either he was confused himself or he was malicious and trying to mislead me. Thankfully I knew enough about the Bible and the corruption in today's modern versions to contend for the faith. I wrote him back and told him that Satan had duped him. I showed him from 1st Timothy 3:16 in the accurate King James Bible that Jesus was indeed the manifestation of the God in the flesh. Jesus is almighty God (John 1:1-3,14; John 10:33; Revelation 1:8). The man never wrote back. It is worthy to note that the Jehovah's Witness' Interlinear New Testament states inside the front cover that it comes from the same exact Greek as Westcott and Hort as all modern corrupted Bibles. After 30 years of work, in 1881 Brooke Foss Westcott and Fenton John Anthony Hort completed their Greek New Testament translation based upon the corrupt Alexandrian, Egypt, manuscripts. It is upon this Greek perversion of the Word of God that nearly all modern Bible revisions are based. Satan is behind the Alexandrian texts (also known as the “Minority Texts”). Our beloved King James Bible was translated from entirely different Greek source known as the “Textus Receptus” (or “Majority Texts”) which originated from Antioch, Syria. God preserved His Words in a majority (as it has been said, “There is safety in numbers.”) When someone changed the Holy Bible, the majority of the pure texts in the churches were used to identify the corruption and correct it. Here's a flow chart to explain the two sources of the various Bible versions. The chart shows that our faithful 'Textus Receptus' (or 'received texts' from which our King James came) originated in Antioch, Rome. The corrupted Greek of Westcott and Hort originated in Alexandria, Egypt. This is THE TRUTH behind the numerous Bible versions available today. Nearly all of them have been translated from the corrupted Egyptian texts, and many others have been adversely influenced by the Alexandrian texts. It was in Antioch, Rome where the believers were first called “Christians” (Acts 11:26). God's sovereign plan and omnipotence are breathtaking! The 47 King James translators (There were originally 54, but some did not feel “worthy” for such an undertaking) rejected the Apocrypha, but at the end decided to include it between the Old and New Testament for its content of historical knowledge. The Apocrypha mostly appears in the Roman Catholic Douay version of the Bible. Our beloved King James Version today does not have the Apocrypha in it, as it was never recognized by the translators as being an inspired part of God's Words. Please note that I don't call the King James Bible a “version,” because it is the Word of God. God only wrote one Book, which is clear to those who love the Lord Jesus Chris, and have an honest and pure heart in the matter. The evidence is irrefutable and unmistakable to those who want the truth. Only the King James Bible uplifts and honors the Lord. For example: In every place where the King James Bible says people “worshipped” Jesus, modern corrupt Bibles change the word to “knelt” instead. Well, you can kneel before a king without worshipping him. If you drop something on the floor and bow down to pick it up, you are not worshipping that object. The Bible says the leper in Matthew 8:2, and many others, “worshipped” the Lord Jesus Christ. Amen! Don't let Satan deceive you my friend. All modern Bible versions are corrupted by Satan. The precious King James Bible mentions the doctrine of the Godhead in Acts 17:29; Romans 1:20 and Colossians 2:9. Those three mentions are the total times that the word “godhead” is mentioned in the King James Bible. ALL modern versions completely remove the word! Clearly, the doctrine of the Godhead (often referred to as the Trinity) is under malicious attack today. The deity of Jesus Christ is likewise being viciously attacked in modern corrupt perversions of the Bible. Satan is the author of confusion, not God (1st Corinthians 14:33). If I had my way, I would burn every New International Version of the Bible in existence! I would burn every copy of Today's International Version as well. I would burn every copy of the corrupted New King James Version. In fact, I would burn every perverted Bible out there, including the Living Bible and Good News for Modern Man. I would burn the Revised Standard Version. God only wrote one Book folks! 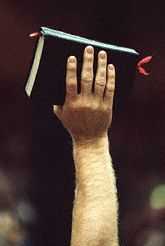 Deuteronomy 8:3 and Matthew 4:4 commands us to live by “every word” that proceedeth out of the mouth of God. To do that we must have an “every word” Bible. God promised in Psalms 12:6-8 to preserve His Words unto every generation. We have those preserved inspired Words today in the English language (which is becoming the international language in the King James Bible. We have it in the 1611 King James Bible, which has been tested and proven trustworthy over the centuries. Just take a look at all the apostate “Praise Worship” in churches today and see which Bible version they're using... anything but the King James Bible! 2nd Timothy 4:3, “For the time will come when they will not endure sound doctrine; but after their own lusts shall they heap to themselves teachers, having itching ears.” Satan is a real person I assure you, but the Devil is a spirit and we cannot see him directly. All of the war, hatred and crime in this world are evidences that Satan is the god of this world as the Bible teaches in 2nd Corinthians 4:4. Satan comes only to deceive (Matthew 7:13-15). Satan is a liar and father of all liars and murderers (John 8:44). Satan appears to us visible as “an angel of light,” appearing through false ministers and false Bibles to deceive the masses. I commend Professor Christopher Lane for being vigilant on this critical issue in the churches today. Dr. Lane, whether he intended it or not, has contended for the Christian faith better than most deadbeat Bible scholars and deeper-life theologians buried in some preacher's cemetery (seminary). Dr. Lane's point is blatant and blunt—Too many translations have led to lack of confidence in a reliable Bible today, because they all say drastically different things, which produces drastically different doctrinal changes in our beliefs and faith. It's nice to know that someone is watching what is going on. I love what Dr. Lane does in his work, tracing the roots of today's religious uncertainty in the churches. Keep in mind dear reader, that the Bible teaches Satan comes to deceive us, by turning good into evil and evil into good (2nd Corinthians 11:3-15). Satan deceptively appears as being a good angel (spirit), and his ministers of unrighteousness do also deceitfully appear as being ministers of God. One example of such a demonic minister is televangelist Benny Hinn, who perverts the Biblical doctrine of the Godhead, instead teaching that there are nine members of the Godhead. It may be a joke to Hinn's staff, but the people sitting on the edge of their seat believe every word that he speaks on spiritual matters. It's bad enough that there are many covetous publishing companies in America, printing literally hundreds of English Bible revisions to confuse everybody. But even worse, there are preachers today who are turning, turning away from the inspiration of the King James Bible. So now, not only are people confused about all the different Bible, but now they're also confused about the inspiration of the King James Bible. From the very beginning, in the Garden of Eden, Satan changed the Words of God into a lie (Genesis 3:1). God said in Genesis 2:16b, “Of every tree of the garden thou mayest freely eat.” But in Genesis 3:1b, Satan said to Eve, “Yea, hath God said, Ye shall not eat of every tree of the garden?” Do you see how Satan said the exact opposite to Eve of what God said? As I showed you earlier in Philippians 2:6 in the NIV, that is exactly what the modern Bible revisions are doing, that is, changing God's Words to say the exact opposite of what God said. The King James Bible is absolutely inspired, each and every Word, from Genesis to Revelation! God's Words are inspired. God doesn't inspire a language. God doesn't inspire a version. God doesn't inspire a publishing company. It is GOD'S WORD themselves which are inspired by God. God's Words have always been inspired and always will be inspired, meaning, they came forth from God, word-by-word. God's Words don't cease to be inspired when they are translated into a different language (if they are correctly translated). God's Words will always be inspired. If a translation is NOT accurate, then they are not God's Words. The New International Version (NIV) are NOT God's Word. Those are man's corrupt words. It is not a mere coincidence that all key passage concerning the deity of Jesus Christ have been changed in the Alexandrian texts. In John 3:16 the NIV completely removes the word “begotten,” thus perverting the Scriptures. Every believer is an adopted son of God (John 1:12), but Jesus is the one and only “begotten” Son of God (making Jesus God). John 3:16 in the NIV says Jesus is God's only Son. That's simply not true. God has many sons (Romans 8:14). Here's a great Bible study by Dr. Jack Hyles called, HOW WE GOT GOD'S WORDS. In his article, “FAITH ACCORDING TO THE BIBLE(S),” Dr. Lane has successfully identified something that a small, faithful, bastion of fundamental preachers have been proclaiming for decades, that is, that all these Bible translations floating around in our churches are causing much confusion (religious uncertainty). The conclusion of most scholars (including Dr. Lane) and most people today is that we don't have a reliable Bible, because they all disagree significantly in doctrinal meaning. Someone has to be wrong if God is a holy (morally perfect) God of absolutes! Jesus reiterated in Matthew 4:4 the teaching from Deuteronomy 8:3 that God wants man not to live by bread (food) alone, but by “every Word that proceedeth out of the mouth of God.” Logically, if we are to live by “every Word” of God, then we need an “every Word” Bible. I believe we have God's inspired words today in the King James Bible, which faithfully honors and uplifts the deity of Christ and the Godhead (which modern versions attack and diminish to appease sectarian bias (which is openly stated in the introduction to the NIV). They literally invited several dozen of the different denominations to a meeting and said, “Tell us what you want in a Bible.” Hence this is how the NIV and every other corrupt Bible on the market came to be. The NIV 2011 horribly butchers the Bible to cater to feminists and homosexual agendas. This is exactly the kind of DRASTIC changes that Dr. Lane is talking about between the various translations. It is a serious matter to wrest (twist) the Words of God (2nd Peter 3:16-17). The NIV teaches the heresy of Lordship Salvation (i.e., the false teaching that to be saved, a person must make Jesus “Lord” of their life, surrender their will to serve God, and follow Jesus in obedient holiness). This is a false Gospel of works for salvation. Works has been added to faith. Churches all across the world have embraced this false Gospel. Initially it sounds good—make Jesus your Lord—surrender all to Christ—make a commitment to Christ—believe in Jesus Christ who died for our sins. Yet, this is not the Biblical Gospel. You simply receive Jesus as your Savior to be saved. Then, gradually, as you grow in the milk of the Word, you yield more and more to Jesus as your Lord, until finally one day you pass into glory and are rid of the flesh. As long as we have this ole corruptible flesh to contend with, Jesus will never completely be the Lord of our life. Jesus is Lord, you don't make Him Lord. To add “making Jesus Lord” to the simple plan of salvation, is to frontload the Gospel, that is, to require everything of the Christian life up front. That changes the Gospel from being “the simplicity that is in Christ” (2nd Corinthians 11:3), to being very complicated. The Biblical Gospel is the DEATH, BURIAL and bodily RESURRECTION of Jesus Christ (1st Corinthians 15:1-4). Making a commitment is consecration, not salvation. Making Jesus “Lord” is impossible. Inviting Christ into your life is not salvation. You don't make Jesus Lord—HE IS LORD! The very moment that you receive the Gospel of Jesus Christ as full payment for your sins, you are eternally, instantly and irreversibly born-again into the family of God and saved! Discipleship has nothing to do with Salvation. Eternal life is a free gift (Romans 5:15; 6:23; Ephesians 2:8-9; Titus 3:5). Salvation is receiving, not giving. Eternal life is received, not achieved. You don't go to Heaven because of what you are doing, you go to Heaven because of where you are looking! LOOK TO JESUS! Jesus warned in Matthew 7:21-23 that many religious people will appear before Him on Judgment Day and say, “Lord, Lord,” have we not done many wonderful works in Thy name, cast out demons in Thy name, and preached in Thy name? Then the Lord Jesus Christ will say to them, “Depart from me ye cursed into everlasting darkness, for 'I NEVER KNEW YOU. '” What a shock it will be for billions of self-righteous religious people in eternity when they are rejected by the King of kings and the Lord of lords, for failing to do God's will concerning salvation. The Bible gives us the plain answer in John 6:40. Jesus plainly tells us the will of the Father... “And this is the will of him that sent me, that every one which seeth the Son, and believeth on him, may have everlasting life: and I will raise him up at the last day.” The Gospel (Jesus' death, burial and resurrection) plus faith equals salvation! Do you believe the Gospel? In the 1901 American Standard Version, by contrast, the emphasis shifted from "substance" and "assurance" to "things" as a whole: "Faith is assurance of things hoped for, a conviction of things not seen." In 1973, the New International Version decided to render that idea even more conspicuously: "Faith is being sure of what we hope for and certain of what we do not see," a statement that thoroughly transforms the meaning of the King James Version, equating faith with the certainty of hope as if the two were identical. In the space of seven decades, in sum, the stress had changed from conviction to being certain, a dramatic change in emphasis and stance. Websites that reproduce different versions of the Bible along side each other are especially effective (even if they don't intend to be) in demonstrating how much of its meaning hinges on translation decisions. Such differences do not bother every religious denomination, many of which welcome more colloquial renderings, but the differences do bother denominations, including evangelical ones, that continue to represent the Bible as infallible, as the literal Word of God. Professor Lane is absolutely correct, “even minor changes in translation have dramatic implications for the way people view and understand their faith.” Which is why we as God-fearing, Christ-honoring, Bible-believing Christians must continue to make a big fuss over which Bible is genuine, and which one's are not. "Considering the importance of the line in Hebrews as an anchor to Judeo-Christian belief and faith, it's worth noting—as websites detailing various editions of the Bible underscore—that even minor changes in translation have dramatic implications for the way people view and understand their faith." It is tragic that a secular English professor and intellectual historian can clearly see the battle facing churches today concerning the importance of maintaining the integrity of the Bible, whereas the tens-of-millions of church members themselves cannot see the forest for the trees.